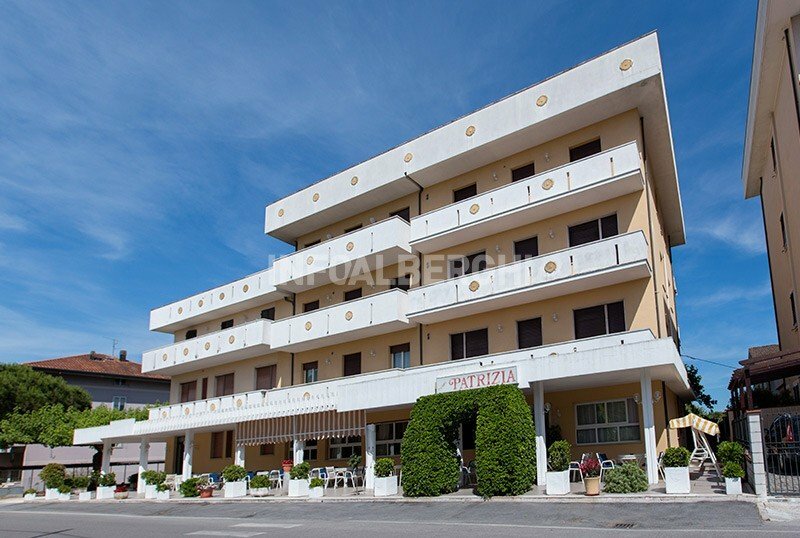 Hotel Patrizia , 2 stars of Bellaria Igea Marina, has free parking, a bright dining room, a large open-air porch, air-conditioned rooms and a children's playground area with a slide and swings. Organize musical evenings with dances and hot ring-shaped cake. It offers genuine, typical local cuisine with a buffet of appetizers, vegetables and fruit. We accept small and medium-sized animals. The hotel is located in Bellaria Igea Marina, in a green area 250 m from the sea, near the "Santa Fè" fun park with train, car track, elastic networks and more. Also within walking distance is the Parco del Gelso, ideal for morning walks and jogging. They have a balcony, air conditioning and heating, TV, safe, private bathroom with courtesy set, box or shower curtain. FAMILIES: spacious rooms with multiple beds are available, equipped with large balconies with drying rack. Large open-air porch, free use of bicycles with child seats, lift, bar, reading room, musical evenings. The hotel is equipped for cyclists. PARKING: indoor and outdoor available. WI-FI : in the common areas. AIR CONDITIONING : in the dining room and in the rooms. CONVENTIONS : beach, amusement parks, gym and nightclubs. PETS : small and medium-sized animals are allowed. BREAKFAST : buffet with homemade cakes, yogurt, brioches, jams, honey, fresh fruit, cappuccinos, juices, chocolate, tea, milk and coffee. LUNCH AND DINNER : choice between two menus based on meat and fish with homemade pasta. Buffet of vegetables, appetizers, fruit and, at the end of the meal, always different desserts. Recipes inspired by the Romagna tradition made with selected ingredients. Water included with meals. In hotel: outdoor playground area adjacent to the dining room, bicycles with child seats, bottle warmer, live entertainment. At meals: flexible hours, high chairs at the table, baby menu and baby food preparation, refrigerator available to mothers. The hotel has an agreement with Bagno Gino n. 59-60. Prices are per day per person for a minimum stay of 3 days. ALL-INCLUSIVE: Full Board + Water, Wine and soft drinks with meals + Beach Service. Super offer dedicated to children! Throughout the summer, children up to 3 years are FREE in the room with 2 adults. Great discounts even for 1 adult with 1 or more children. Special offer from May 30th to June 14th: children up to 12 years FREE in the room with 2 adults. Children 0-12 years FREE if in room with two adults! Summer weeks on offer All Inclusive! Discover our packages designed for all summer in All Inclusive! 7 days stay from May 30th to June 14th, starting from € 600 for 2 people. Child up to 12 years FREE! 1 week to choose from June 30th to July 26th, starting from € 765 for 2 people. FREE and super discounted kids. 1 week to choose from July 27th to August 2nd, starting from € 750 for 2 people. Well-kept, hospitable environment with excellent Romagna cuisine for only € 43.00 per person in full board with water included. Do you visit the parks? Tickets can be picked up at the hotel at discounted prices and free for children. - beautiful rooms with balcony, bathroom with shower, TV and air conditioning. - healthy and genuine cuisine with a choice of two menus and rich buffets.